Historians always like to go back to original documents because they can read the material for themselves -not a version filtered through the ideas of others. Also, they can obtain a wider impression of the society and culture in which historical events took place – they can understand the historical context. 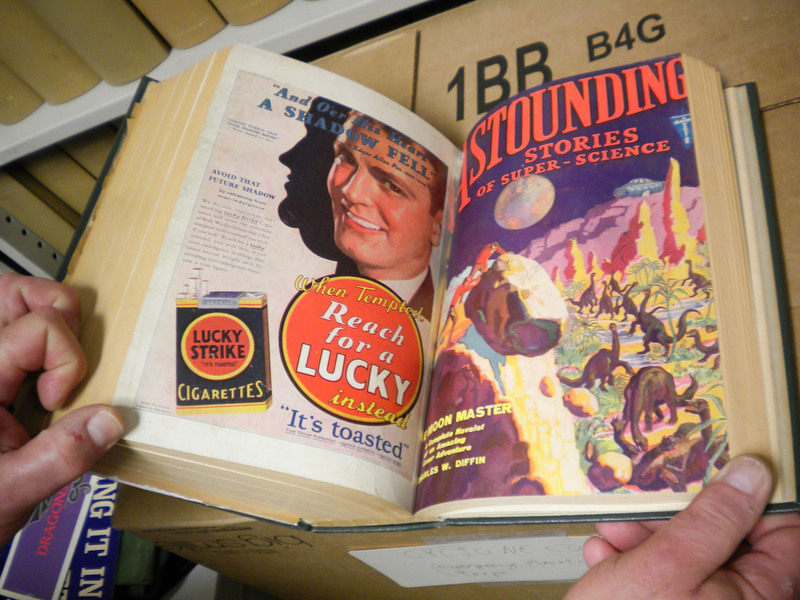 Some of the earliest documents about Dianetics and Scientology appeared in “Astounding Science Fiction” – and I have recently obtained a complete run of “Astounding”. Discuss their significance in the development of Dianetics and Scientology. 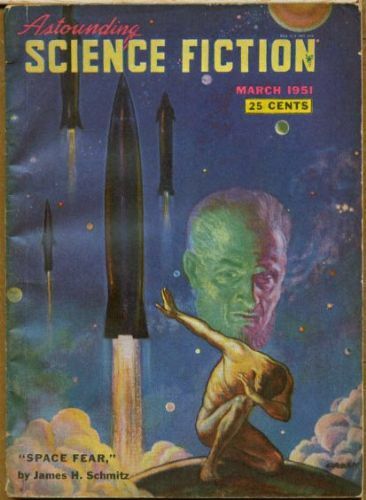 The first publication of L Ron Hubbard’s Dianetics was in the pulp magazine “Astounding Science”. In December 1949 the magazine’s editor, John W Campbell, started a campaign to promote what he believed to be a revolutionary ‘new science of the mind’. This post includes five issues of “Astounding”(from December 1949 to April 1950 inclusive). It describes every reference to Dianetics during that period, and provides images of the more important ones. You can also download each issue in its entirety. I hope that I have caught every reference. However, if you come across anything I have missed, please tell me about it via the feedback page, or by leaving a comment. In the previous part of this series we examined the evidence and arguments that L Ron Hubbard presented to support the claims he made for Dianetics in the May 1950 issue of “Astounding Science Fiction” (download the whole issue here as a /pdf file). We have not yet discussed the last part of the article, in which Hubbard describes how Dianetics will supposedly change the world. I’m saving that for the next part of this series. In this part, I would like to examine an interesting aspect of Dianetics – Hubbard’s comparison of the operation of healthy human mind with a perfect computer – the ‘analytical mind’. In the Dianetics article, Hubbard compares the typical human mind to a mechanical calculator with a stuck key – a “held down 7”. It is capable of accurate computation but is failing because of a simple fault. Hubbard presents Dianetics as a means to restore the functioning of a person’s faulty ‘analytical mind’ and realise their potential for superhuman power . This imagery owes a lot to contemporary stories about ‘mechanical brains’ (and, incidentally, represents a classic pulp fiction power fantasy). 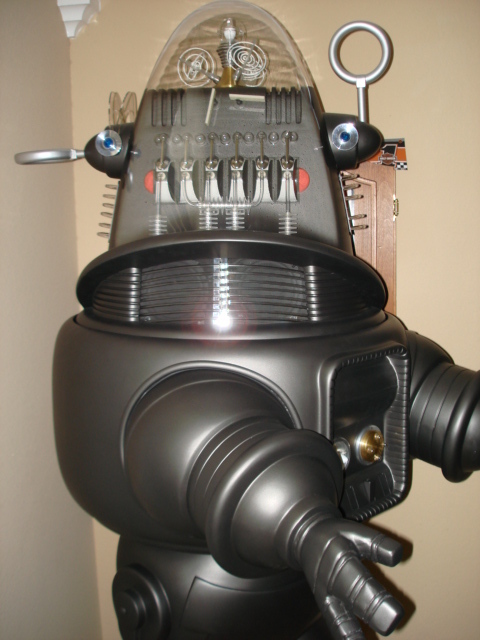 Robbie the Robot (from the film “Forbidden Planet) is a perfect example. When Robbie ‘thought’ the moving parts inside his transparent head clattered like a mechanical adding machine. All unknown to Hubbard, in the period before, during and after the publication of Dianetics the theoretical foundations of computer science were being laid. The development of electronic computers led greater intellects than his to wonder about the relationship between computing and the human mind. 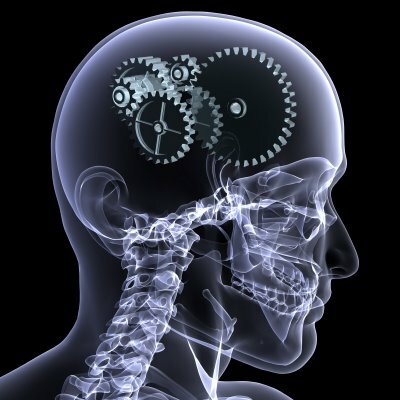 Their speculations and conclusions led to modern computers and,years later, contributed an important thread to the new discipline of cognitive psychology. This perspective enables us to understand why Hubbard’s ideas about the ‘analytical mind’ are so hopelessly shallow and naive. I n this post, I am going to complete my examination of the article in the May 1950 issue of “Astounding Science Fiction” which began in this post covering the ‘theory’ of Dianetics. To recapitulate: the editor of “Astounding” Jon W Campbell (an early convert) gave L Ron Hubbard an unprecedented amount of space in his magazine to describe a supposed ‘new science’ called Dianetics. 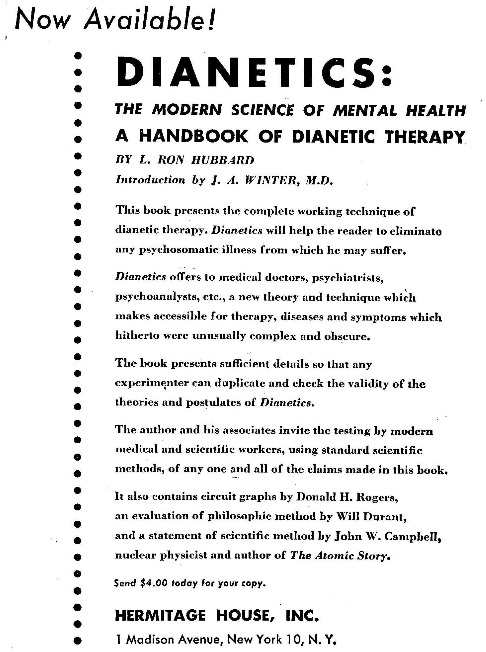 This article appeared just before the book “Dianetics: The Modern Science of mental Health” was published, and contributed greatly to the dianetics fad that followed. In this post, I will discuss the last part of the Dianetics article, in which Hubbard discusses the supposed future applications and development of Dianetics (none of which actually came about) beginning on page 84. 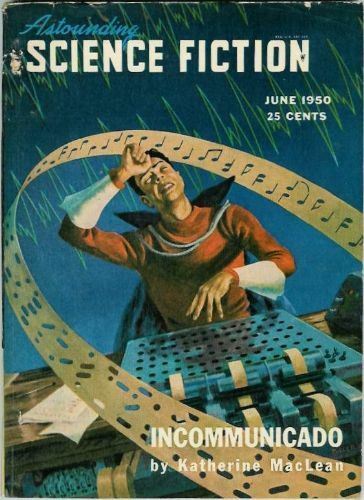 However, it was not until another article about dianetics by Hubbard appeared in “Astounding Science Fiction” in May 1950 that his creation become a popular fad, and kick-started Hubbard’s career as guru. So far in this series I have covered the build up to the publication of “Dianetics” in “Astounding” and closely examined the actual article. This post discusses the references to dianetics that appeared in the two issues which followed Hubbard’s article – in June and July. These can be downloaded via the text links above the cover images (the July issue appears after the break). In these two issues, Campbell is obviously determined to keep the dianetics bandwagon rolling. We have already seen how he heavily promoted both L Ron Hubbard and the dianetics article before it appeared. These two issues show how he maintained interest in Hubbard and dianetics until he could begin to publish the reader reaction and build on it. They also show how he kept a canny eye on the promise of a substantial boost in circulation. After L Ron Hubbard’s article about dianetics had been published in the May issue of “Astounding” the magazine’s editor, John W Campbell had a serious problem – he was flying blind. This was 1950 – because of the time it took to prepare, print and distribute a pulp magazine it was impossible for him to respond to reader interest until the August issue. 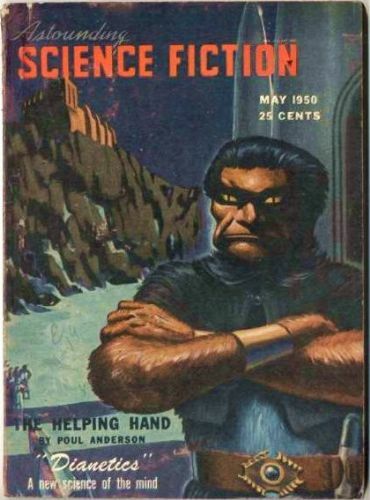 In the June and July issues of “Astounding Science Fiction” Campbell did his best to promote interest both the article and Hubbard’s recently published book. However, he must have a spent an uneasy week or so worrying that there would not be any reader response. In fact, there was, and in the August issue, which is discussed after the break, Campbell milks it for all it’s worth. Despite John W Campbell (the editor of “Astounding) promising to host a lively debate about dianetics, airing both pros and cons, the letters page proved disappointing. Four of the seven letters that appeared there were published were by people with vested interests in the success of dianetics – and the longest by far was written by L Ron Hubbard himself. I thought Hubbard’s letter was worth examining in detail, because it demonstrates how he was already well-practised in the rhetorical tactics he would later use to defend Dianetics and Scientology without actually addressing the issues. 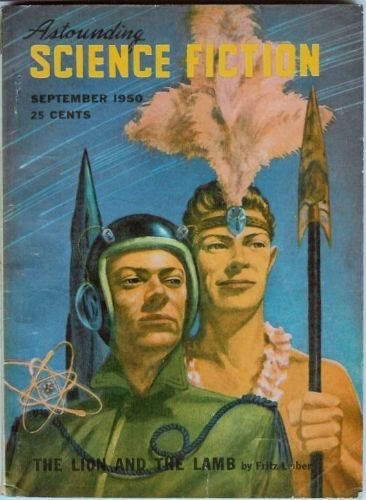 The September 1950 issue of “Astounding Science Fiction” provides a wonderful insight into how the most intelligent, capable and educated people can let wishful thinking run away with their critical faculties. This month, in the same magazine that he was still using to actively promote L Ron Hubbard’s dianetics, the editor, John W Campbell, published a sceptical article and a book review by L Sprague De Camp. Both were excellent. The article concerned religious, literary and scientific hoaxes and misinformation. It included an extended passage about medical quackery. It is a compendium of fringe ideas which De Camp proceeds to debunk. He even analyses how it is that some scientists fall for such nonsense, and offers advice on how to spot pseudo-science. He describes Campbell, Hubbard and dianetics to a tee, without ever referring to any of them. De Camp’s book review examined Emmanuel Velikovsky’s “Worlds in Collision“. This was based on the scientifically illiterate ‘theory’ the world’s history and mythology were influenced by catastrophes brought by a wandering comet (which has since settled down and become the planet Venus). De Camp took Velikovsy apart. It is a terrible irony that, at the very same time Campbell published De Camps sceptical articles, the most influential pseudo-science of the last 65 years – dianetics – was right under Campbell’s nose and he could not see it for what it was. Instead, he was enthusiastically promoting Hubbard’s invention in “Astounding”, and would continue to do so. 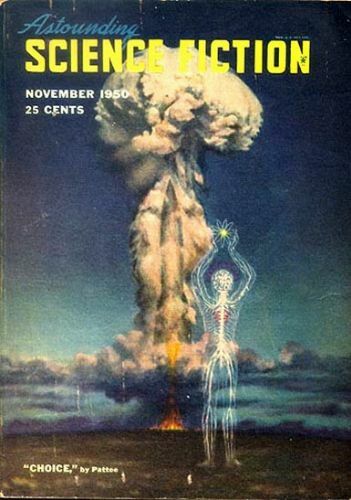 The October 1950 issue of “Astounding” contains L Ron Hubbard’s follow-up to his long article in the May issue (discussed here in One | Two | Three parts) which had introduced dianetics. Hubbard’s new article is entitled, “The Analytical Mind”. It’s another long haul, so we will examine it, in detail, in the next part of this series. In this post, I would like to discuss the attitudes of writers who worked for “Astounding” and the readers who patronised it with reference to the contents of the October 1950 issue. It seems to me that the stories, readers and writers of “Astounding” can be placed at different points on a rational – irrational continuum. At one extreme are the careful, rational people like L Sprague De Camp who wrote sceptical articles and carefully thought-out stories. Then there were the purveyors of power fantasy, whose fiction provided an escape from a disappointing reality. Next, there were those whose writing mistook fiction for reality. Finally there was the occasional outright fraud. There are examples of each type in the the pages of this issue. Taking a closer look at them, and the historical context in which they operated, may help us understand why so many people took dianetics so seriously in the 1950s. 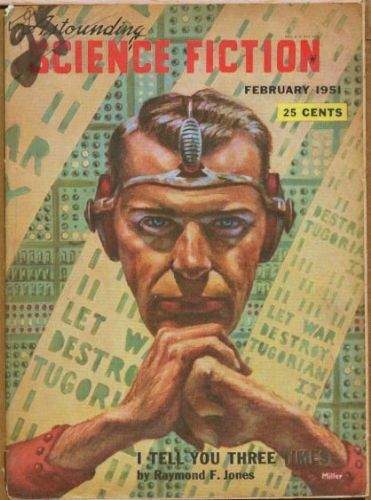 In this post we will examine the long article by L Ron Hubbard entitled, “The Analytical Mind” which appeared in the October 1950 issue of “Astounding Science Fiction”. The rest of the October issue was covered in the previous post in this series. “The Analytical Mind” is Hubbard’s follow-up to the May 1950 article that introduced dianetics to readers of “Astounding”. Its almost as long, but it lacks the numerous illustrations that were a prominent feature of his original text. At the time issue was published the “Hubbard Dianetic Research Dianetic Foundation was growing rapidly, and taking in a great deal of money. This was not to last, but as far as Hubbard was concerned, he was riding a perfect wave. He was now anxious to address criticism both from followers and outsiders. in this post we examine both the November and December 1950 issues of “Astounding”. It will become clear that the ties between Hubbard and Campbell, and the association between dianetics and “Astounding” are beginning to dissolve. The dianetics institutes are now making money – for Hubbard. Campbell and “Astounding” have been left out in the cold. What’s more, both readers and authors are starting to look elsewhere to read and sell the science fiction stories which were “Astounding’s” bread and butter. Over these two issues we can see Campbell take control of the helm once more, and turn his ship around. He implicitly promises readers that there will be no more dianetics articles and a return to a varied selection of quality stories. Also, he reaches out to new writers to replace those he has lost to dianetics. 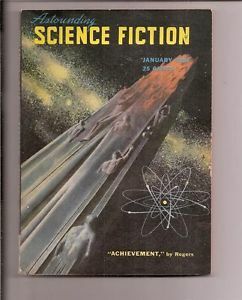 This series of posts is nominally about dianetics and Scientology in “Astounding Science Fiction”. However, I could not resist including this book review from another pulp science fiction magazine, “Planet Stories“. 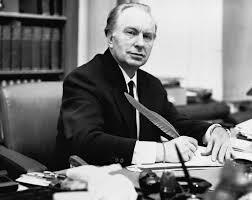 It discusses L Ron Hubbard’s book, “Dianetics: The Modern Science of Mental Health”. 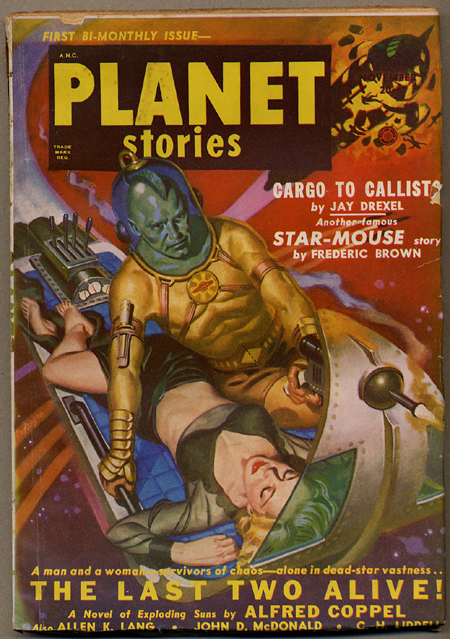 Hubbard’s book had been published in May 1950 and was was reviewed in “Planet Stories”by James Blish, who was an imaginative and well-respected science fiction writer. It demonstrates, once again, how intelligent, capable people who took a scientific, sceptical view of the world, nevertheless somehow accepted the unsupported claims Hubbard made for his creation and embraced dianetics (a phenomenon that I have discussed in this post). During this series, we have seen this happen to John W Campbell (the editor of “Astounding Science Fiction”) and, elsewhere in this blog, the author William Burroughs. 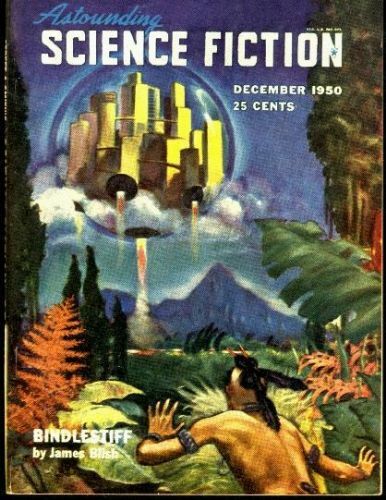 In the last part of this series, I suggested that readers of “Astounding Science Fiction” were beginning to tire of L Ron Hubbard’s lengthy articles about dianetics, and wanted more science fiction stories instead. Also, I wondered if Campbell’s stable of writers, whom he had carefully nurtured, were beginning to look elsewhere to sell their stories. Whatever the reason, after a long period during which he had heavily promoted dianetics in his magazine, at the end of 1950 Campbell returned “Astounding” to its core business, and left the new ‘Hubbard Dianetics Institutes’ to stand on their own feet. This issue contains the very last article by L Ron Hubbard to be published in “Astounding”. This little-know piece was entitled “Dianometry”. However, in the absence of modern communication and information technology, 50’s pulp magazines were slow to react. Two or three months could elapse between writing an editorial and delivering it into the customer’s hands. Stories and articles required an even greater lead time. Consequently, if there was a change in policy it could take some considerable time to put it completely into effect. Campbell seems to have been forced to publish “Dianometry” because it was already at the printers before he changed his mind. In this post, we will examine the evidence in this issue that Campbell has decisively turned away from dianetics. In the next post, we will take a close look at Hubbard’s swansong – his very last article for “Astounding Science Fiction”. In the previous part of this series, we examined the January 1951 issue of “Astounding”. This contained the last article about dianetics by L Ron Hubbard that “Astounding” would publish. 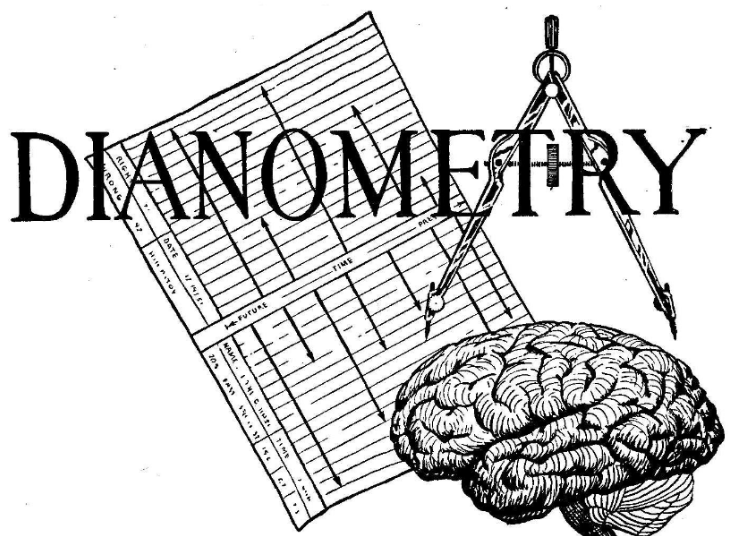 It was entitled “Dianometry” It begins on page 76, and it is a curious text. 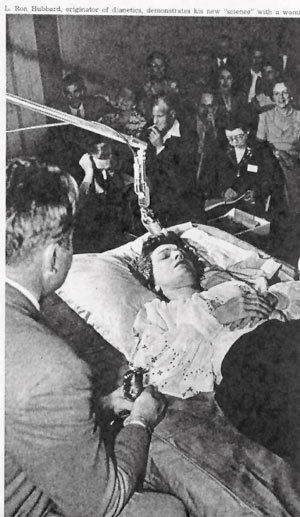 Since its introduction in the May 1950 issue of “Astounding”, dianetics had boomed. At the beginning of 1951 money was pouring in and the “Hubbard Dianetics Institutes”, which were supposed to research and develop this ‘new science’ were expanding, . This was not to last. Hubbard treated the income from the institutes as if it were his own money and, as the fad for dianetics passed, the institutes went bankrupt. After this bankruptcy, Hubbard was to temporarily lose the copyright to dianetics. Undeterred, he arranged to have the institutes mailing lists stolen for him, and used then to recruit for his new enterprise, which he called Scientology. Dianometry was the last gasp of Dianetics. For various reasons (discussed in this post) the fad could not be sustained beyond a certain point. The bankruptcy of the dianetics institutes was, in the long run, a stroke of luck for Hubbard – it enabled him to start again with a relatively clean slate, and avoid the mistakes that he had made the first time around. All that now Hubbard could do now was to try could do to keep the ball rolling was by elaborating his pitch with articles like “Dianometry”. This article clearly did not have the popular appeal of his earlier appearances. It was for for enthusiasts of dianetics only. As such, it was an even less appropriate for a science fiction magazine. The declining ‘pulling power’ of dianetics articles could have contributed to Campbell’s loss of interest. It seems that Dianetics itself had run out of steam. Over a year after its editor, John W Campbell, began promoting dianetics (in the December 1949 issue) L Ron Hubbard’s free ride in “Astounding” had drawn to a close. Readers had been complaining that the coverage of dianetics had replaced too many of the stories which they bought the magazine for. Also, popular contributors (e.g. 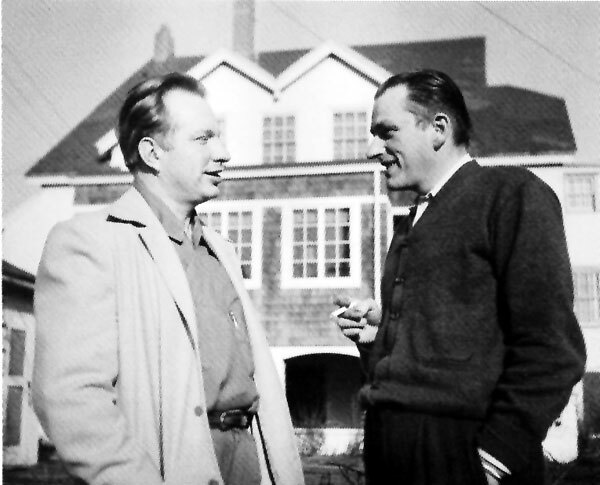 L Ron Hubbard and A E Van Vogt) had abandoned fiction writing to head the new ‘Dianetics Institutes’. To maintain his circulation, Campbell had to start publishing more quality stories and recruit the new authors who could be relied upon to write them. In the November and December 1950 issues Campbell, had explicitly promising more SF. He also (symbolically) changed the subscriptions advertisement from one (which had boasted about being the magazine which first introduced dianetics to the world) to a more conventional version (which boasted of the quality and variety of its science fiction instead). The new ‘Dianetics Institutes’ now had to pay their way by advertising, like everyone else. There would be no more articles about dianetics. Campbell was likely also beginning to have doubts about Hubbard’s claims for Dianetics, and beginning to distance himself from the fad that he played a major part in creating. This theory is supported by the terse rely he gave to a reader’s letter inquiring after L Ron Hubbard (and additional evidence will be presented in the next post in this series). Despite Hubbard’s relative absence, the February 1951 issue (presented here) still contains interesting insights into Hubbard’s curious personality and the phenomenon of dianetics. 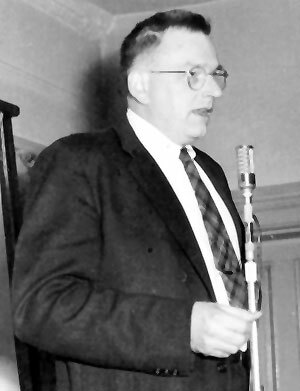 John W Campbell, the editor of “Astounding” had staked his reputation (and that of the magazine he edited) on the truth of dianetics. He was now becoming impatient for vindication. He hoped this would be provided in the form of ‘case studies’ from L Ron Hubbard which would ‘prove’ the effectiveness of ‘dianetic therapy’. He had good reason to do so. On September the 9th 1950, the American Psychological Association had issued a statement strongly advising members not to use dianetics in their practice because there was no evidence it was of benefit. This forced Hubbard’s hand. He responded with a statement promising to release the evidence which would he asserted would prove his case. Campbell reacted cautiously to Hubbard’s statement. He seems to have resolved not to publish any more pro-dianetics articles dianetics until Hubbard made good on his promise. We can see this situation develop in the pages of the March 1951 issue of “Astounding Science Fiction”. In the letters page of the March 1951 issue of “Astounding” John W Campbell, the magazine’s editor, made it clear that he was waiting for L Ron Hubbard to deliver on his promise to provide supporting evidence for dianetics. This promise had been reported in the New York Times for September 1950. 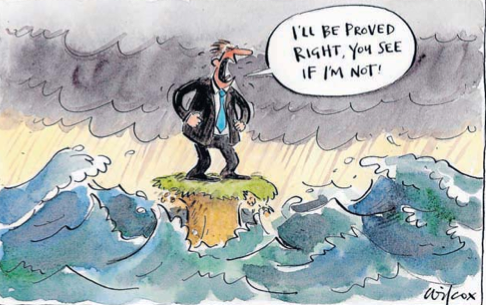 Hubbard, under pressure from the American Psychological Association, had stated that he would publish case studies which provided objective evidence – and that they would ‘prove’ all of the claims he had made on behalf of dianetics. Of course, this ‘evidence’ simply didn’t exist, and was never produced. It’s possible that Hubbard also privately told Campbell that he would publish “[…] a book of ‘case studies” in order to persuade him to extend his support just a little longer. If so, it didn’t work. After March 1951, the next six issues of “Astounding” contained no significant editorial reference to dianetics or Hubbard. Campbell was calling Hubbard’s bluff. These six issues (April to September inclusive) are included in this post, so that they can be contrasted with their predecessors, which so enthusiastically promoted dianetics.